2012 is, of course, the Year of the Olympics, especially if, like me, you happen to live in or around London. And riding on the back of the British Olympics is a year-long celebration of Shakespeare. It is heartening to see that when we think of what is most worth celebrating about Britain, it is still to Shakespeare we turn. But there is another year-long literary celebration to look forward to: 2012 is the bicentenery of the birth of Charles Dickens. And I see that the celebrations have started early in the Guardian Books pages. As a devoted Dickensian, I was wondering how I was going to celebrate it. Our Mutual Friend has been up for a re-read for along time now, so I might go for that. I might also read Sketches by Boz, a collection that I have, so far, only dipped into. I also have Peter Ackroyd’s massive biography staring down at me accusingly from the shelves, but although I love Dickens the Novelist, I don’t think I like Dickens the Man at all from what I know about him, so I might give that a miss. Over the years, I have written, on various boards, and on this blog, what seems like entire volumes’ worth of stuff on Dickens. And it strikes me that much of the time, I’ve been on the defensive. This is because it has long seemed to me that Dickens attracts more unfair criticism than just about any other novelist of comparable stature. Of course, it is also true that Dickens was more deeply flawed than any other novelist of comparable stature (of novelists of the foremost rank – and Dickens most certainly belongs to this rank – the only other novelist I can think of who was as deeply flawed is Dostoyevsky); but all too often, it seems to me, his flaws are noted while his more-than-compensatory greatness ignored; or worse, flaws are seen where, to my mind, there aren’t any. At times, even, certain features in his writing that seem to me marks of genius are criticised as weaknesses – e.g. he is often criticised for creating caricatures when his superlative gifts as a caricaturist seem to me to be worth celebrating rather than denigrating. As a consequence of all this, when I write about Dickens, I perhaps get too defensive. Of course, no writing in praise of Dickens will be credible if it doesn’t acknowledge at least some of the flaws, but even here one has to be careful: those elements of his creative personality that are responsible for the flaws are the same elements that are responsible for much of his greatness. In other words, his genius and his flaws are part of one indivisible package. But when I do acknowledge flaws, it is generally to the early books I turn, and this is unfair. Of all the articles that have appeared on Dickens in the Guardian Books pages so far, the one I particularly liked was Simon Callow’s on the early novel Nicholas Nickleby. Callow says, very elegantly, just about all that can be said about this novel within so short a space. He reminds us, among other things, that Dickens, still in his mid-20s, kicked off his career as a novelist by producing Pickwick Papers, Oliver Twist and Nicholas Nickleby all within a mere 18 months. Now, that is just phenomenal. Yes, yes, all three novels (especially Nicholas Nickleby) are flawed in many ways; yes, granted, they don’t present any profound vision of human life, and nor do they probe into the human psyche; but what is there that can match these works for sheer brio and exuberance? Where else can one find such variety of colour, such delight in human eccentricity? Is there, I wonder, any other novel so packed with iconic scenes and images as is Oliver Twist? Callow rightly says that to find an antecedent, we must go back beyond Shakespeare to Chaucer and The Canterbury Tales. The noted critic Edmund Wilson thought Austen and Dickens were the two finest British novelists, and, while I accept that literature should not be treated as a competitive sport, that’s probably a fair judgement to make. Certainly, Wilson’s erstwhile friend Nabokov did not have any quarrel with it, even though, like me, he personally preferred Dickens. (And that’s where my resemblance to Nabokov ends!) I can’t remember the bicentenary celebrations for Austen back in 1975, but here’s to a year and more of celebrating my favourite novelist. Since I can’t provide a link, I suppose I should provide some sort of summary of it, but that is not easily done: it’s a long article, with many qualifications and nuances. And, to be honest, I am not sure I have understood it properly. I have read it over a few times to make sure that Professor Currie really is saying what he appears to be saying. But if he is, then, professor or no professor, what he is saying, or seems to me to be saying, is utter nonsense. Research in psychology laboratories indicates that the concept of an underlying human character that determines to a great extent how people think and behave is weak; and that the thought and behaviour of humans is far more likely to be influenced by the stimulus of the moment. Since fiction – i.e. novels, short stories, plays – focus primarily on character rather than on the stimulus of the moment, the understanding fiction provides of human behaviour is unrealistic and spurious. Therefore, fiction should be enjoyed merely as a self-referential entity. We must not allow that fiction has any connection with the reality that lies outside it. I appreciate that Gregory Currie is a professor of psychology, and I appreciate also that I am quite ignorant of the subject, by my response on first reading Prof Currie’s article, and my response still after the umpteenth reading, is a somewhat inarticulate “Eh?” Of course one recognises the importance of immediate stimuli: when I am tired and hungry, I tend to become irritable; when I am warm and comfortable, I tend to feel contented; and so on. Show me any novelist who is not already aware of this. Indeed, show me anyone with half a brain who is not already aware of this. But this overrides underlying human character and personality? Really? If we receive an unexpectedly large bill, I tend to panic and become flustered; my wife, affected by the same stimulus, remains calm and collected, and sorts matters out. If our underlying characters aren’t as important as the stimuli of the moment, then why is it that we react so differently to the same stimulus? Maybe I have misunderstood what the good professor is saying, but I have read the article over a few times, and I really can’t see that my summary above, albeit simplified, is an inaccurate reflection of the article. (I’d welcome any correction on that point.) And what particularly concerns me is the conclusion of the article: literature, Prof. Currie concludes, must not be regarded as something that relates to real life; it is but an enjoyable and sometimes intellectually stimulating game, but it has no more connection to reality than has a crossword puzzle. If this is all literature is, then it is worthless. Homer, Shakespeare, Austen, Tolstoy, Ibsen, Joyce – you could discard the whole damn lot, and, other than losing a means of whiling away a few idle hours, we would not be any poorer for it. As if it weren’t bad enough that various strands of postmodernist thought, with its insistence that words cannot depict reality, or even that there is no objective reality to depict, have already reduced literature to a mere parlour game! Now psychology is getting in on the act by claiming that something that is and always has been bleeding obvious (that we react to stimuli of the moment) is a new discovery, and that it invalidates any claim of literature of depicting the real world. Literature is not easily capable of abstraction: if it cannot depict reality – either through what we call “realism”, or through some other stylised means of depiction – then it is nothing. And I find it sad to see so many academics, so many literary academics at that, so busy sawing away with glee at the very branch on which they are sitting. I’m not so sure why I left it so late to read John le Carré. I have long enjoyed intelligent, well-written thrillers, and my favourite Graham Geene novel, The Human Factor, was a consequence of Greene very consciously entering into John le Carré territory. So it was high time, I decided, to read at least one by the acknowledged master of the genre, and I decided to go for one generally acknowledged to be among his best – A Perfect Spy. After all, even allowing for overstatement one expects from blurbs, it’s hard not to be impressed by the quote from Philip Roth printed on the cover: “The best English novel since the War”. In retrospect, I am not sure that this was the best introduction to le Carré’s fictional world. Oh, it’s impressive enough – but it’s not purely a spy thriller: much of its formidable 750 or so pages is given to material that is not, strictly speaking, thriller material. Perhaps to begin with I should have picked an unambiguous thriller– maybe Tinker, Tailor, Soldier, Spy, also generally reckoned to be amongst le Carré’s finest. For although A Perfect Spy is an engrossing read throughout, it is noticeable that the tension markedly ratchets up when the purely thriller elements come to the forefront. The scenes, for instance, in which Brotherhood goes off on his own to track Magnus down indicate a very accomplished thriller writer, and I, for one, wanted a bit more of this kind of stuff. But that was clearly not the main purpose of this novel: the central thrust of this work deals with more internal, psychological matters. The psychological studies contained in the other parts of the novel are certainly very fine, but where, in a conventional thriller, they would be introduced to support the plot, here it’s the plot that exists to support the psychology. In other words, this novel is not plot-led, and any expectation in that direction on the part of the reader is bound to be disappointed. The genre of the spy thriller offers obvious opportunities to explore several important themes – morality, loyalty, betrayal, personal identity, and so on. Indeed, the genre itself seems almost designed to tackle such themes. What does it do to the human personality when one commits acts which, under normal circumstances, can only be judged as immoral? Sure, one may do such things out of loyalty to a concept of a “greater good”, such as the welfare of one’s country; but what happens when other loyalties conflict with this? What happens when personal loyalties interact and interfere with these broader loyalties? What happens to the human psyche when deception becomes an integral part of one’s life, when one has to keep secrets and lie through the teeth even to one’s own family? What happens when one has to acquire different layers to one’s mental make-up? Does there continue to exist a centre that holds? Or is one’s personality merely like the onion in Ibsen’s Peer Gynt – merely layer after accumulated layer with no real core? The central character of A Perfect Spy is Magnus Pym, a diplomat who is also an agent. A double agent, as it turns out. He is a man of many secrets, many different layers, and no-one, not even perhaps himself, is quite aware of what, if anything, really lies beneath all these layers – whether or not the onion in this case actually has a core. After the death of his father early in the novel, something inside Magnus seems to snap: he walks away from everything – his colleagues, his career, his wife and son – and, incognito, takes refuge in a seaside lodging house in Devon, scribbling long, furious accounts of himself and of his past life to his teenage son in boarding school, and to Jack Brotherhood, his erstwhile mentor in “The Firm”. The novel consists of two alternating narrative voices – that of Pym himself, as, with increasing bitterness, he communicates his life story both to his son and to Brotherhood; and a more objective third person narration, depicting the search for an agent who, it now appears, had more secrets than “The Firm” had realised, and who, it is feared, may now have defected. The subjective first person narration, increasingly febrile, interacts with and counterpoints the more objective third person narration. I suppose any narrative structured in this manner recalls Bleak House, and personally, I really don’t know that it is wise for even so accomplished a novelist as John le Carré to invite comparison with Dickens at his finest. But if we put comparisons aside, the double narrative does on the whole work well. As we approach the climactic sequence of the novel, the two narratives converge; but, given how very long it has taken to get to this stage, the pay-off isn’t, perhaps, quite as thrilling as it should have been. There’s no denying, however, le Carré does write engaging prose, and he knows also how to pace and structure a complex narrative. No doubt, Graham Greene would have done all this with greater economy, but economy in itself need not be seen as a virtue: le Carré takes his time, certainly, but crucially, he never bores the reader. He has sufficient confidence in his own abilities to slow the pace down as and when he wants to, in the full knowledge that he has the reader’s attention, and he need not therefore rush. The result is not always the “rattling good read” that some readers may demand from a thriller, but it most certainly does hold the reader’s attention. However, while Pym’s accounts of his early life are engrossing, perhaps they aren’t quite engrossing enough: there were certainly times when I wanted the novel to return to the more obvious thriller material, for when it did, the tension noticeably increased. The story Magnus has to tell of his life is a remarkable one. It is dominated by his father, a big time crook and confidence man who, despite his charm, or, perhaps, because of it, has caused immense suffering to a great many people. From the very beginning, Magnus has to involve himself in deception, and the skills he learns in the process make him the “perfect spy” of the title. But now, with the burden of his father’s presence lifted, Magnus has to take stock of himself, and ask difficult questions. What lies beyond all the lies, beyond all the deception? His fear is that for all his sophistication, he may be no more than the amoral crook his father had been, using other humans merely for his own ends; or even worse, that there is nothing at all at the centre of his personality once all the lies and deceptions have been stripped away – that the onion doesn’t really have a core. The novel is not without its problems. Once the realisation is reached of what Magnus truly is, where is there then to go? What is there for the novel to do other than merely fizzle out? So long and so patient a build-up needed, I think, a bigger denouement. But the journey to this end had been a thoughtful one, and an entertaining one, and certainly makes me keen to try out other works by this writer. But I’d like to read him in a more purely “thriller” mode: Tinker, Tailor, Soldier, Spy, I think, beckons. Much of the poetry I read is from anthologies, but reading merely the “Greatest Hits” is not, perhaps, the best way of coming to grips with a poet’s work. And neither is it much better merely flicking through an edition of the collected works, and reading whatever catches one’s eye. So, recently, I tried reading through an entire collection of a poet I usually count amongst my favourites, W. B. Yeats, and my suspicion wad confirmed: even the well-known poems – the “greatest hits” – make a greater impact when read in the context in which it had been published. Reading through the 1928 collection The Tower, one can map across the poems recurrent themes and recurrent imagery – until the various fragments seem to cohere together mosaic-like into a greater whole. From somewhere in the neighbouring cottages. And that he changed into a hare. But what’s the good of the imagination so excited, so passionate and so fantastical, when that “caricature” old age nullifies it? What does it matter that one’s heart is “sick with desire” when it is “fastened to a dying animal”? Out of all this questioning, another theme emerges: is there an aspect of one’s self that is distinct from one’s failing flesh? What, indeed, is the essence of one’s self, of one’s being? A golden artefact created merely to keep a drowsy emperor awake, but which does not decay as human flesh decays. It cannot be “sick with desire” because it cannot desire in the first place. It is utterly impersonal. Can such impersonal permanence really contain the essence of one’s self, of one’s identity? This first poem, “Sailing to Byzantium”, is not resolved: it cannot be resolved. On the one hand, there is a desire for immortality; but that desire can only be satisfied in a state in which no desire is possible. And the innumerable clanging wings that have put out the moon. What does Yeats mean by “put on”? The suggestion seems to be that Leda, violated, objectified, and then discarded, powerless in the face of divine wickedness and indifference, took from her violator some of his divine knowledge, and, perhaps, foresaw the cataclysmic consequence of this divine act – “the broken wall, the burning roof and tower, and Agamemnon dead”. But the expression is ambiguous. And tear the heart out of his side. As though God’s death were but a play. Drive to a flashier bauble yet. Out of the fabulous darkness called. The implicit parallel drawn between Leda, raped by an indifferent classical deity, and Mary, impregnated by the Holy Ghost without the stain of original sin, must seem blasphemous indeed, but the closeness of these poems in the collection reinforces the parallel: in each case, a new cycle is brought into being by divine action. Not Leda, then, but Leda’s daughter, but whether Helen or Clytemnestra is not made clear. I must confess to finding this imagery both disturbing, and confusing: Yeats seems clearly to be referring back to “Leda and the Swan”, but to what purpose, I do not know. But he thinks of that “Ledean body” now, “hollow of cheek”: like himself, this Ledean body he dreams of has also aged. Perhaps the invocation of the myth of Leda and the Swan indicates another sort of violation that humans suffer from the gods – old age, the decline of faculties. For which young mother, asks Yeats, could she but picture her child “with sixty or more winters on its head” could “think it a compensation for the pang of his birth”? And so the poem that had began with the poet walking “through the long schoolroom questing” ends with a question: can the essence of what it is to be human separated from the movement it undergoes through life? Can it be extracted from the movement, and reshaped merely into a changeless golden artefact? This poem (like, indeed, all the other poems in this extraordinary collection) cannot be discussed adequately in a few short paragraphs: its different layers of meaning haunt the mind, and resonate in all sorts of ways. But in many ways, it seems to me Yeats’ version of Wordsworth’s “Ode on the Intimations of Immortality”: in both works, the poet laments the decline from the state of childhood, the losses incurred, but then, with an almost superhuman effort, look for some degree of comfort in what is left behind. And one was drowned in the great bog of Cloone. There, the moonlight was imagination, and the “prosaic light of day” reality: and mistaking one for the other les to madness, and to death. In “I See Phantoms of Hatred and of the Heart’s Fullness and of the Coming Emptiness”, the final poem of the sequence “Meditation in Time of Civil War”, Yeats had spoken of “the innumerable clanging wings that have put out the moon”. And now, the deceptive power of the imagination returns, and leaves the young man the poet had been “but a lout”. Classical scholar Peter Levi describes these as “amongthe most Sophoclean lines ever written in English”, although he adds “Sophocles would not have given his thoughts the romantic touches that Yeats gives to these lines” (from “Greece and the Hellenistic World”, published 1986 by Oxford University press). But then again, this is not a translation of Sophocles: though based on a chorus from Oedipus at Colonus, this is very much a Yeatsian poem, the Romanticism of his earlier work never quite extinguished, despite the uncompromising pessimism of the content. In the final poem of the collection, the magnificent “All Souls’ Night”, Yeats calls upon three ghosts, three dead people, people now freed of their flesh and in a state in which “names are nothing”. Yeats brilliant re-creates them as they had been in life, each striving, in his or her own way, to look beyond their mortal selves into an eternity in which the incompleteness of life may find some sort of resolution. What that resolution can be, Yeats does not of course know: indeed, he knows that he cannot know. All he knows is the incompleteness of this life, and this poem, and, indeed, this entire collection, is a passionate and heartfelt lament for that incompleteness. I see from Guy Savage’s blog that a hitherto unknown novel by James M. Cain has been discovered. Whether it’ll match his finest work I don’t know, but if it does – or, for that matter, even if it doesn’t – it should be worth a read. I retain vivid memories of my first encounter with James M Cain. It was in October 1989, when, out of season, we (that is, my wife and I) were driving around the Scottish Highlands. 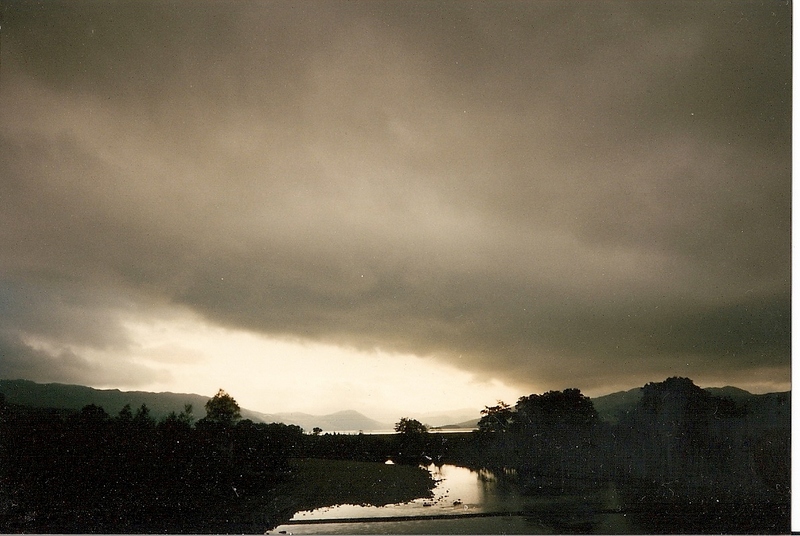 October, admittedly, is not the usual time for touring the Scottish Highlands, but I’d recommend it: the light of the approaching winter lends to that stark and austerely beautiful landscape a dark and even, perhaps, a somewhat menacing aspect. Strange as it may seem, it was just the right atmosphere in which to read The Postman Always Rings Twice, and Double Indemnity: the Scottish Highlands may seem distant indeed from American noir, but somehow, the two seemed to complement each other: the sense of evil contained in these two short novels seemed all the more intense. I had seen the films, of course. The Postman Always Rings Twice has been filmed twice, neither entirely satisfactorily: the 1946 film was flatly directed, and the casting of Lana Turner – lacking a strong screen personality even at best of times – in what was on paper one of the most powerful and dramatic of female roles proved disastrous. The 1981 version was better directed (by Bob Rafelson) and certainly better cast (Jessica Lange and Jack Nicholson seemed almost made for these roles), but or some reason that I can’t quite put my finger on, this one didn’t take off either. Double Indemnity, of course, had fared somewhat better on film: Billy Wilder’s film is archetypal noir, and remains possibly my favourite thriller of all: it is hard to see how any aspect of this film could be bettered. But when I came to read it, I was in for a surprise: the film, scripted by Billy Wilder and by Raymond Chandler, no less, stays within the boundaries of the crime thriller: the book, on the other hand, slips almost imperceptibly into Grand Guignol. By the time we come to that ending, it is pure horror. Of course, this story had been done before: wife and lover murdering husband had appeared most memorably perhaps in Thérèse Raquin by Emile Zola, and in Lady Macbeth of Mtsensk District by Nikolai Leskov. But Cain’s variations on this theme are every bit as remarkable, if not more so, than its illustrious predecessors. But I don’t think I have ever read anything more chilling than the final pages of Double Indemnity. And I am sure that the circumstances in which I read it added to the effect. For, as we were driving near Loch Carron one afternoon along single-track mountain roads, a mist began to descend. The light was thickening, and the crows were making wing to the rooky wood; good things of day were beginning to droop and drowse, while night’s black agents … etc. etc. We had no option but to stop at what our road atlas indicated was a village. That village consisted of a small railway station, a couple or so houses (one of which was marked a “Bed & Breakfast”), and a pub that, thankfully, served meals. Now, the temptation in describing this scene is to overdo it for dramatic effect, but there are times when real life seems to borrow a cliché or two from cinema and literature: I swear that it took a few knocks before the front door of the Bed & Breakfast creaked open slowly; I swear the lady of the house was an ancient, grey-haired lady who lived there on her own (or so she said! ); I swear we were the only guests that night; and I swear that the house was full of cats. And we were, back in those days, a young, holidaying couple. Even the most cynical and jaded of scriptwriters may hesitate to pile on so many clichés on top of one another. As if that weren’t enough, the bathroom, we discovered once we had checked in, was painted a vivid Hammer-horror read. We had little choice. We tried taking a walk, but the darkness was descending. I attach a photograph I took on this walk with our not-too-expensive camera (this is before the days of digital cameras, of course): I doubt this would win any award for landscape photography, but it does capture the atmosphere of that time and that place as I remember it. It was here that I read Double Indemnity. It is a short novel, and easily read in a few hours. I won’t give away anything of what happens in it in case you haven’t read it. And in case you haven’t, please do. Even if you’re not in a ghostly Bed & Breakfast on a dark October evening. I cannot think of any other novel, except – in their very different ways – Henry James’ The Turn of the Screw and Dostoyevsky’s Demons, that projects so powerful a sense of evil. I’m afraid this is where my clichés run out. The night we spent was peaceful, and in the morning, the lady of the house proved indeed to be amiable and hospitable. She served us a fine breakfast, after which we paid up, and drove away. Not the ending that a scriptwriter would have chosen, no doubt, but true for all that. Cyber-friend and fellow blogger Somewhere Boy draws my attention to this scene from the 1934 play Victoria Regina by Laurence Housman, brother of A. E. Housman of A Shropshire Lad fame. Queen: Albert, may I come in? Albert: Yes, Dearest, if you wish to. Q.: What are you doing? Q.: Oh! How exciting! May I stay, and watch you? A.: If it would interest you, Weibchen. Q.: But of course: to see you shaving is wonderful! Something I never thought of. A.: Oh? Did you think one did not have to shave at all? A.: No, I suppose not. Q.: How often do you have to do it? Once a week? Q.: Every day! But how absurd! It can’t grow as fast as all that. A.: Oh yes, it does. Q.: How very troublesome! Why, I only cut my nails once a week. A.: Nails can wait longer; beards won’t. Q.: I wouldn’t like you to have a beard. A.: Nor would I. That’s why I am taking it off now. Q.: How strange it looks! … and how interesting! – … Is it dangerous? A.: Not if you don’t talk to me. Q. (a little startled): Oh! A.: – not just while I am stroking myself. Q.: Stroking yourself! Oh, Albert, you are funny! A.: Is that not the right word? Ought I to have said “wiping myself”? – or what? from not having to know – I’ve not been taught. A.: Ah, Vicky! It is nice to hear you say that! Then you, too, do not know the English language quite like a native. For that – if it were not for the soup – I would kiss you. Q.: Oh! Not “soup”, Albert darling. Soap! Q.: But I don’t mind the soap, Albert – your soap – if you would like to. A.: Very well, then; now I will. It has often been said that I tend to start many of my posts with the words “It has often been said”. Or something equivalent. And that, further, without citing any evidence, I create a straw man which I then go on to dismantle with great relish. I plead guilty to not citing evidence, and I plead lack of time as a mitigating factor: when posts are written in the few free odd minutes I can find in the midst of everything else, researching and cross-referencing do, I confess, generally take a back seat. However, I do insist that those words “it has often been said…” introduce things that I have frequently heard said, or, more often, have seen written on various discussion boards and blogging sites around the internet. Now that’s over with, let’s start this post properly. Take two. We all thought we wanted to find books that all over the country, all over the world, people would read and enjoy. We were looking for enjoyable books. I think they are very readable books … We wanted people to buy these books and read them, not buy them and admire them. Other people said to me when they heard I was in the judging panel, ‘I hope you pick something readable this year’. That for me was such a big factor, it had to zip along. He added further that the judges did not want to pick books that “stay on the shelves half-read”. The first question that occurs to me is what people such as Chris Mullen, a Member of Parliament, or Stella Rimington, a former spy, are doing in the first place on a judging panel of a prestigious literary award. Neither is a literary academic, nor a literary journalist, and neither is famous primarily for their writing. Yes, they’ve both written a few novels on the side, although how distinguished these novels are – whether or not they “zip along” as they should – I am, I am sorry to say, in no position to judge. But in neither case is there anything to indicate that their literary judgement, whatever it may happen to be, should carry more weight than anyone else’s literary judgement. It’s not that the Man Booker Prize is something I can get too worked up about. The few winners I have read have not particularly impressed me, and the books nominated for the prize – and even the book winning the prize – are generally not of any great interest to me. That is not to say that they are necessarily bad books as such: on the contrary, I am sure that many of the winners or short-listed books are very good indeed. But based on my past reading experience, merely the fact of winning or of being short-listed does not, in itself, indicate to me any particular likelihood of literary merit. After all, the book that won the Booker of Booker award a few years ago, a novel acclaimed almost universally by the modern literary world as a great masterpiece, as an instant classic, struck me as merely vapid and meretricious, so who am I to judge on these matters? Or even, for that matter, to pass my opinion? There is far too much of modern fiction that I have read that I have been assured are masterpieces, but which have frankly bored me. I don’t want to make too much of this: let us just say I am not particularly in sympathy with contemporary literary fiction, and leave it at that. And, this being so, who gets short-listed for the Man Booker prize, or who wins it, is, I generally find, of little interest to me. So for all I care, they can rope in as many television personalities and former spies and celebrity chefs as they wish. But what has struck me this year are the stated criteria of two of the judges this year, including the chairman: the winner this year must be “enjoyable” and “readable”; it must “zip along”. These, indeed, have been said. Let’s refrain from mocking: it’s easy to mock. Let us try to consider as dispassionately as we can these criteria. I have no objection to books that “zip along”. Indeed, many of my favourite books, from Voltaire’s Candide to Raymond Chandler’s Farewell, My Lovely zip along very nicely. But is zipalongability really a criterion of literary quality? Why should it be? Surely, any novel should unfold at a tempo that is right for that novel. The right tempo for Farewell, My Lovely is fast, and the right tempo for The Magic Mountain is slow. One cannot be prescriptive about such matters. I’m sorry – I’m stating the bleeding obvious, aren’t I? It has often been said … where was I? Ah yes … it has often been said that I spend too much time in my posts stating the bleeding obvious. But I do confess to finding it hard to argue against the Booker Prize judge Chris Zipalong Mullen MP without stating the obvious. And as for Stella Rimington’s criterion of “readability”, that is yet another term that should be placed, I think, in the Dictionary of Oft-Used Critical Terms that Mean Nothing. What does it mean to be “readable”? Unless something is written in a language I don’t understand, it’s readable, in the sense that I can, at least, read it (if not necessarily understand it). What is usually meant by “readable” is that it is easy to read, and once again, I’m struggling to see why that should necessarily be considered a literary quality. Any criterion that rules out works such as The Golden Bowl or Ulysses does not strike me as a particularly useful criterion in this context. And in any case, is “easy to read” necessarily the same as “readable”? After all, Dan Brown is easy to read: a very limited vocabulary and very simple sentence structure hardly indicate any degree of difficulty. And yet, to judge from the odd passage I have tried reading in bookshops, I find his works utterly unreadable: within a sentence or two, my attention starts to wander. The Golden Bowl or Ulysses are, paradoxically, more “readable” than The da Vinci Code. They are more readable despite being more difficult: unlike the prose of Dan Brown and co, the prose of a Henry James or a James Joyce engages the reader’s attention. Or my attention, at least. And writing that engages my attention does strike me as more “readable” than writing that doesn’t. But I doubt this is what is usually meant by “readable”. In popular usage, “readable” means no more than “easy to read”. I know. It has often been said. But it doesn’t really matter, I suppose: my views on the matter will mean as little to the Booker Prize judges as the Booker Prize judges’ verdict will mean to me. This year, Julian Barnes appears to be the bookies’ favourite to win the prize. I have read a couple of his novels, and have been reasonably well impressed: he is a good writer who takes serious literature seriously. But if he does win, I wonder how he will feel being feted by people whose idea of quality literature are books that are easy to read, and which “zip along”.